Sean Dyche has hailed skipper Tom Heaton's professionalism as he prepares to extend his remarkable run of league starts. Though Heaton withdrew from England duty last Sunday with a minor calf problem, he is set to line up against Southampton at St Mary's on Sunday - his 138th-successive league start. 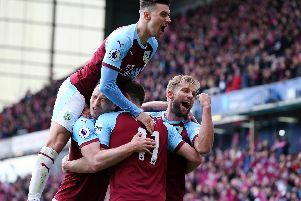 He has started every league game since Dyche signed him from Bristol City in the summer of 2013, and Dyche said: “He’s an excellent professional and he buys into the culture and environment here. "Not just the football side, but the support of the football side, the dietary requirements, the strength and conditioning, and he’s used that wisely. “That helps to protect your body. You can't guarantee every moment of someone’s body, but what you can do is push the margins to them not getting injured. "It’s not an exact science but my support staff do it well and Tom buys into that. “His professionalism helps as well, and to play that many games on the trot is an outstanding thing." Heaton has been having treatment at Gawthorpe after returning from international commitments, and Dyche reiterated: "Tom came back early but we’re hopeful on Tom, he’s had a good few days with the physios and we thank those involved for how quickly he came back because we nipped it in the bud."